Steve Evans has been sacked by Peterborough. Posh are sixth in League One but some indifferent recent performances have led to Evans and his assistant Paul Raynor being shown the door. They drew 0-0 at home to Charlton Athletic today. 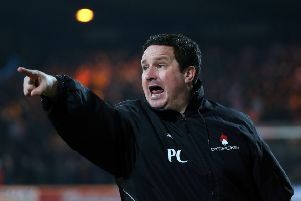 Evans and Raynor left Mansfield for Peterborough in February last year with the Stags pushing for promotion. A statement on Peterborough's website said: "The football club wishes to announce that the manager Steve Evans and Assistant Manager Paul Raynor have been released from their contracts with immediate effect. "We would like to thank both Steve and Paul for their efforts on behalf of the football club. We wish them and their families all the best for the future."